The Infravia system organizes, through trenches made with reclycled plastic walls installed under public walks, the networks of energy, telecommunications, gas, water, sewage and urban drainage. Infravia will be presented at two events in Europe in the coming days. Created by a Startup Catarinense, proposes a concept of sustainable mobility for smart cities. Between days 6 and 8, Infravia will be present at a stand at European Utility Week in Vienna. 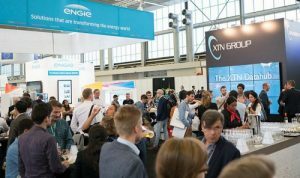 EUW is a platform to meet top-level European energy professionals and do business, form new relationships and drive new projects forward. At the event fair there will be an interactive rug that shows the Infravia system through augmented reality application. In practice, through holographic visualization of underground infrastructure networks, the application indicates the precise location of pipelines, valves, cables and other objects of public utility, facilitating repair work and maintenance in the networks. In the Smart City Expo World Congress, in Barcelona, from November 13th to 15th, the CEO of Infravia Aloísio Pereira da Silva will participate in a panel on Intelligent city Management and Energy Efficiency on the 14th. In the first week of November, Silva also presented the Infravia system to a French dealership in Paris, and to the Bentley team, a partner company in Brazil. Infravia is a Brazilian startup focused on technological development, based on international knowledge and experience. Through cooperation agreements with universities, institutes and public and private companies, Infravia develops constructive systems and innovative solutions for the areas of infrastructure and mobility for smart cities.